Steel or aluminum blanks used to produce stamped automotive parts traditionally are cut using either dies or lasers. The advantage of laser-blanking lines: no need to invest in and maintain, and the blanking operation avoids time-consuming and costly delays during die changes. Enter new coil-fed laser-blanking technology debuted recently by Schuler at the facility of diode-laser manufacturer ALS GmbH, in Dormagen, Germany. 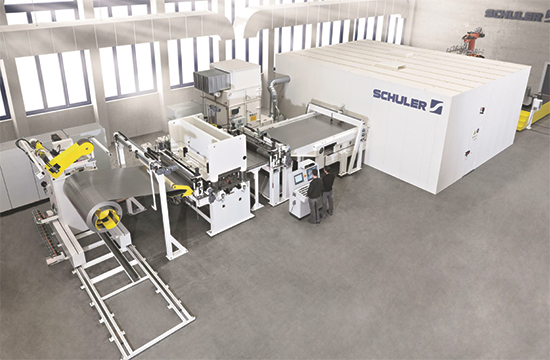 Dubbed DynamicFlow Technology (DFT), the line allows “even small batches to be produced just-in-time at low cost,” says Stephan Mergner, Schuler Automation managing director.” Not only can the line be used to simultaneously produce a wide variety of blank shapes, but blank contours also can be optimized while production is running. “The result: High output rates and tremendous flexibility,” adds Mergner. 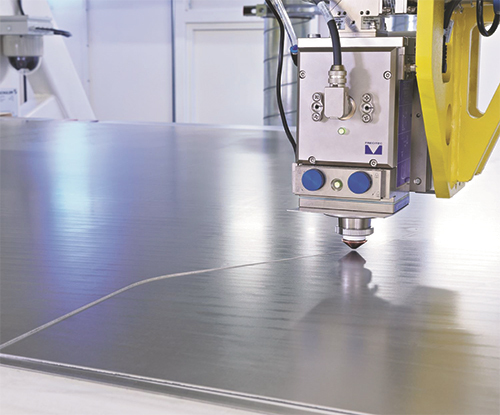 DFT laser-blanking lines are energy-efficient and can process a variety of materials, including high-strength steels, with a high degree of repeat accuracy and edge quality, says Mergner. The process also suits the production of surface-sensitive outer panels. During the presentation at ALS GmbH, customers primarily from the automotive industry witnessed how the line cuts blanks from a continuous aluminum coil. The laser-blanking line employs three laser heads in parallel to cut blanks from material 0.8 to 3.0 mm thick, to 2150-mm wide.